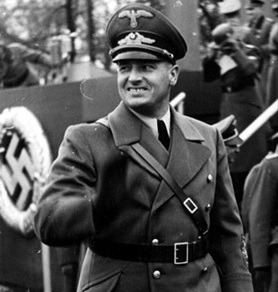 On this date in 1939 in Poland, 56 days after Ger­many in­vaded that coun­try, Dr. Hans Frank, Ger­many’s chief jurist and one of the most vicious pro­ducts of Nazism, was appointed Gover­nor-Gen­er­al of the Gen­er­al Govern­ment—that half of Nazi-occu­pied Poland not directly incor­por­ated into the Reich. It included much of Cen­tral and South­ern Poland, West­ern Ukraine, as well as the major Polish cities of War­saw and Kra­ków. In a “paci­fi­ca­tion oper­a­tion” named Ausser­ordent­liche Be­friedungs­aktion, or AB-Aktion, during the spring and sum­mer of 1940, Frank approved (on May 16) and over­saw the arrest of more than 30,000 Poles who were sus­pected of en­gaging in “cri­mi­nal [i.e., anti-Nazi] acti­vi­ties.” (Working from lists of names drawn up before the war, some 60,000 Poles were rounded up and mur­dered soon after the Ger­man inva­sion of Poland.) During the 1940 AB-Aktion, which may have been coor­di­nated with the Soviets in Soviet-occu­pied Poland, some 7,000 arrested mem­bers of the Polish poli­ti­cal elite, aris­toc­racy, intel­li­gent­sia, and priest­hood were mas­sa­cred, mostly by auto­ma­tic wea­pons. Other Poles were sent to Ger­man con­cen­tra­tion camps, most notably to the newly created camp of Au­schwitz in an area of Poland that was in­cor­po­rated into the Reich, as well as Sach­sen­hausen (20 miles north of Berlin) and Maut­hau­sen (Upper Aus­tria). An anti-Se­mitic fana­tic, Frank also over­saw the segre­ga­tion of the Jews into Polish ghettos. Jews were barred from en­gaging in a long list of acti­vi­ties: par­ti­ci­pating in athle­tic events, walking in public parks, using rail­road waiting rooms, having gold fillings, riding in taxis, carrying brief­cases, wearing felt hats, calling from phone booths, etc. Frank told his senior of­fi­cials on Decem­ber 16, 1941, about the approaching anni­hi­la­tion of the Jews: “Gentle­men, I must ask you to rid your­self of all feelings of pity. 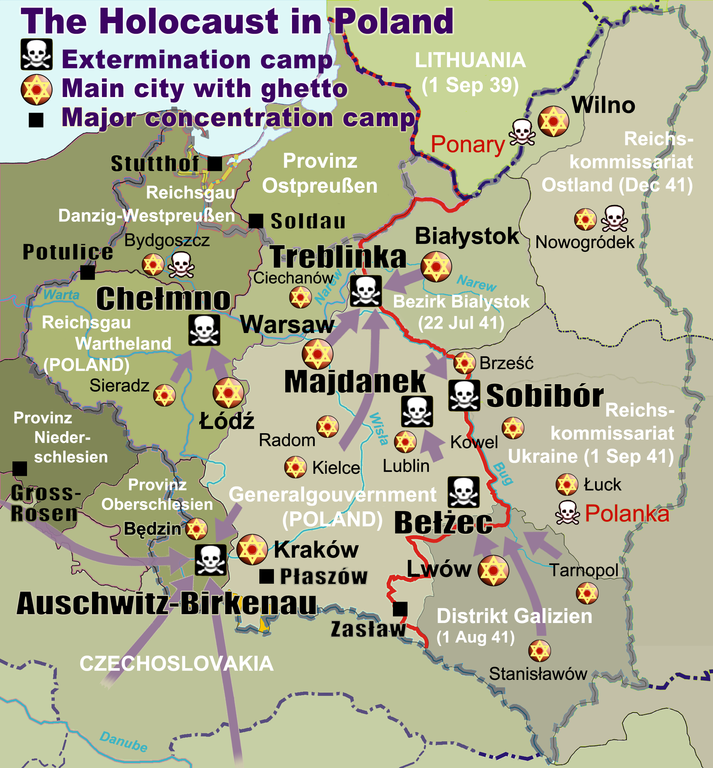 We must anni­hi­late the Jews wher­ever we find them and when­ever it is pos­si­ble.” To that end the Gen­eral Govern­ment became the loca­tion of four Nazi exter­mi­na­tion camps on Polish soil (see map below). Frank fled the Gen­eral Govern­ment in Janu­ary 1945 in ad­vance of the Red Army. Cap­tured by Amer­i­can troops in Bava­ria, he was tried during the Nurem­berg Trials (1945–1946), found guilty of war crimes, and hanged on October 16, 1946. Top: Map depicts borders of Poland up to 1945. For poli­tical and logis­ti­cal rea­sons, Nazi Ger­many built most exter­mi­na­tion camps in occu­pied Poland, home of the greatest con­cen­tra­tion of Euro­pean Jewry. Four out of seven Nazi exter­mi­na­tion camps in Poland were built in Hans Frank’s Gene­ral Govern­ment district: Bełżec not far from a railroad station of the same name, where an esti­mated 600,000 were killed; Majdanek on the outskirts of Lublin, where 360,000 were killed; Sobi­bór near the village of the same name, where 250,000 were killed; and Tre­blinka, where 800,000 were killed. The largest killing com­plex was at Auschwitz–Birke­nau in west­ern Poland, an area annexed by Nazi Ger­many in October 1939 and where an estimated 1.1 mil­lion people were mur­dered. In all of Poland, roughly 3.4–3.5 mil­lion peo­ple were killed in Nazi death camps. One autho­rity claims that between 1939 and 1945 approx­i­mately 5.6–5.8 mil­lion Poles lost their lives, of whom 3.1 mi­llion were Polish Jews, two million were eth­nic Poles, and the remaining half-million were minorities; e.g., Roma (Gypsies). Bottom Left: SS-Obergruppenfuehrer Hans Frank at a 1939 police parade in Kra­kau (present-day Kra­ków), capi­tal of Ger­many’s new Gene­ral Govern­ment. During his tenure as Gover­nor General (1939–1945), Frank insti­tuted a reign of ter­ror against the Polish popu­la­tion, engaged in the sys­tem­atic plun­der and bru­tal eco­no­mic exploi­ta­tion of Poland, and became directly involved in the mass mur­der of Polish citizens, both Jews and non-Jews. 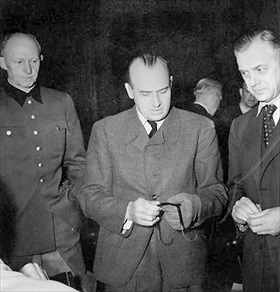 Bottom Right: In this 1945 photograph taken before the start of the Nurem­berg War Crimes Trials, Frank can be seen with Gen. Alfred Jodl (left), Chief of the Opera­tions Staff of the (Ger­man) Armed Forces High Com­mand (Ober­kom­mando der Wehr­macht, or OKW), and Alfred Rosen­berg (right), one of the chief authors of Nazi ideo­lo­gical creeds, including its racial theory, per­se­cution of the Jews, and Lebens­raum (“living space”). All three men were con­victed of war crimes and crimes against humanity and executed on the same day, October 16, 1946.